I got a reminder about the power of the media this past week. A good friend of mine who lives in SE Texas called me and said that he had been contacted by an acquaintance about a “chupacabras” roaming around near an abandoned house on the Trinity River. The creature was allegedly the size of a large coyote and was wandering about and appearing on the porches of homes up and down the river looking for food. It had been spotted eating out of dog bowls on multiple occasions and the locals were worried it would end up hurting someone or one of their pets. When my friend asked this caller to describe the animal they were seeing he got the classic description of the “new chupacabras” popularized by the media: a hairless, blue-gray skinned canid of some sort. I use the term “new chupacabras” due to the fact that these hairless, mangy canids, or blue dogs as many in Texas are now calling them, do not resemble the original descriptions of the chupacabras in any way. The chupacabras legend originated in Latin America, specifically in Puerto Rico. Also called the goat sucker, the chupacabras allegedly attacks small domestic animals like chickens, goats and sheep. It is said that it kills by making two vampire-like puncture wounds on its victim through which it drains their blood. Usually, no other marks are present on the body of the unfortunate victim. Immigration has brought the legend of the chupacabras to America and news outlets have jumped at the chance to label any mystery creature or odd-looking animal as a chupacabras. The most annoying aspect of this is that these outlets are latching on to the legend in name only. 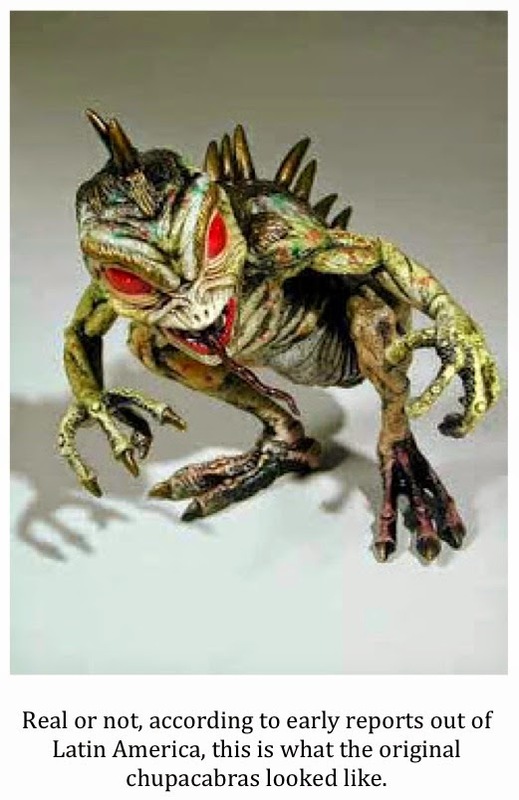 They are completely ignoring how the chupacabras was originally described. According to early reports out of Puerto Rico, the chupacabras was an upright, alien-looking creature with large glowing eyes, spikes protruding off its back and large claws. The “new chupacabras” look nothing like this; however, that fact has not stopped news outlets and magazine shows from labeling every poor mangy coyote and fox seen roaming about as the dreaded chupacabras. My friend, knowing full well what he was likely to find on the banks of the Trinity River was nothing more than a mangy dog of some sort, agreed to come out and have a look and make an attempt to rid the area of the creature. Whatever the animal was, he reasoned, if it was coming up on to porches and approaching homes it was likely sick. A sick animal near people, especially children, and pets is often a bad combination. My friend arrived at the home of the man who contacted him and was told he might need something more powerful than the shotgun he was carrying to dispatch the large creature. While my friend was confident he had more than enough firepower to handle whatever this animal might turn out to be, he was intrigued that this man had been so intimidated by the creature. What followed was as predictable as the sun rising in the east. My friend located the “chupacabras” in the abandoned house on the bank of the river and dispatched it quickly and humanely. As he suspected, the dreaded chupacabras turned out to be nothing more than a very ill fox that was eaten up with a severe case of mange. 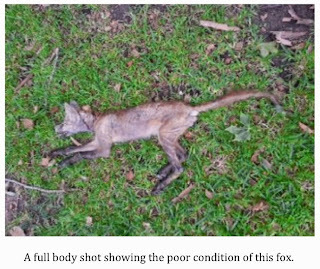 The allegedly large, coyote-sized beast turned out to weigh between 15-20 lbs. My friend called me after he had completed his task and we chuckled over the whole incident. The people living in the area had been completely spooked by the prospect of the dreaded goat-sucker roaming about wreaking havoc. The idea of the much feared chupacabras had been firmly implanted in their minds by local and national media. While there was never any chupacabras on the banks of the Trinity River, it is still a good thing that my friend was called out to investigate and dispatch the animal. Any time wild animals approach humans, it is a sign that animal might be sick. 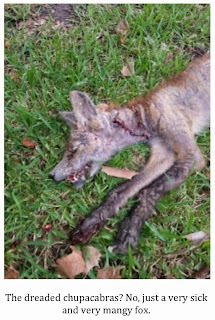 Sick animals can be desperate animals and desperation can lead to dangerous confrontations. 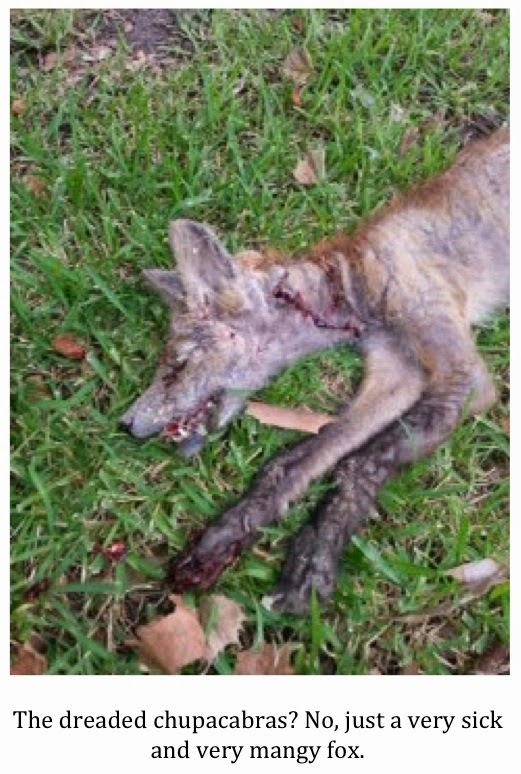 In addition, many diseases, the different types of mange among them, can be spread from wild canids like foxes and coyotes to domestic dogs. 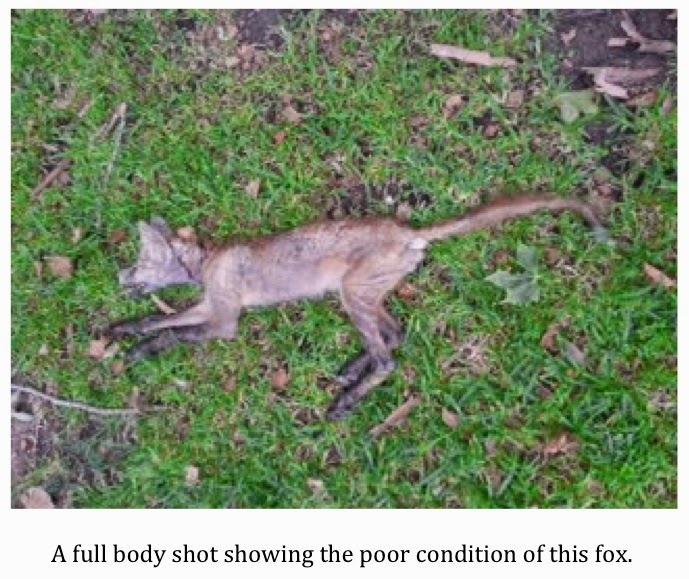 Finally, this little fox was suffering badly. Judging by how emaciated he was, he would not have lasted too much longer. He was slowly starving to death. While it is sad any time an animal has to be put down, his suffering is now at an end. One of my goals when I began this blog was to educate people on some of the more odd animal stories out there. I hope I am accomplishing that to some degree with this post. Simply, hairless, mange-ridden canids are not chupacabras. They never have been and never will be. News people are just exhibiting their ignorance on the topic by their continued insistence on labeling these sick creatures as cryptids or something paranormal. There may be something to the chupacabras legend. I have found that in many cases, if not most, there is at least a grain of truth to myths and legends. Whatever that grain of truth may be when it comes to the chupacabras, it does not involve mangy canids. 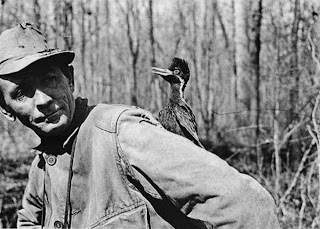 The photo below was taken in the doomed Singer Tract in Louisiana by James Tanner in 1938. 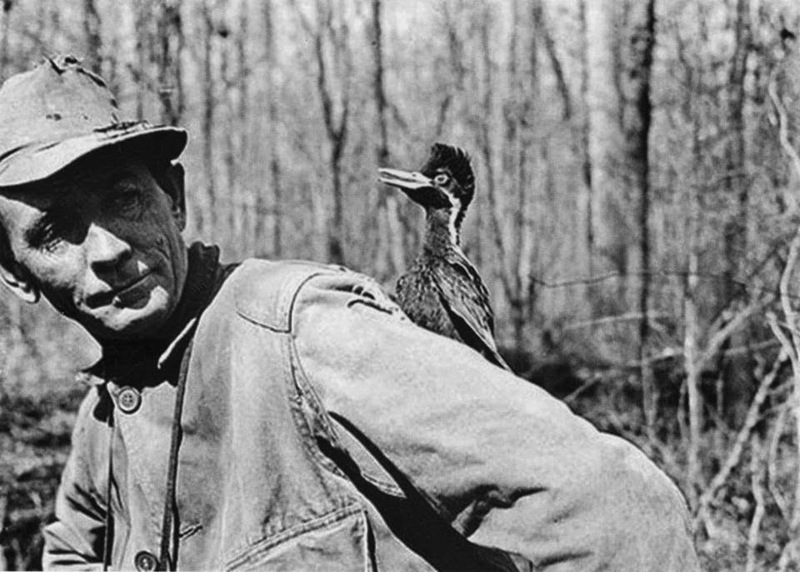 The photo shows an ivory-billed nestling as it rests on the shoulder of Tanner's friend, J.J. Kuhn. This is one of a series of photos taken by Tanner that day that are thought to be the only shots ever captured of a ivory-billed woodpecker nestling. It is heartbreaking to think that this nestling was likely among the last of its kind. Following is my write-up of a recent investigation I did concerning an alleged sighting of a sasquatch, or wood ape, type creature within the confines of Palmetto State Park. What follows is my write-up. For the full text of the witness's original report, visit the NAWAC site here. 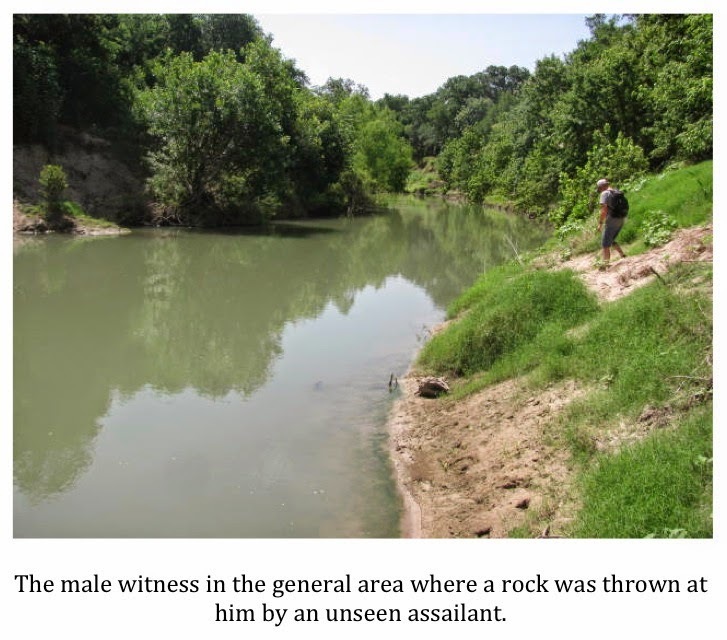 This investigation was conducted as a result of an incident that allegedly occurred in Gonzales County, Texas, within the confines of Palmetto State Park, 08 June 2014. 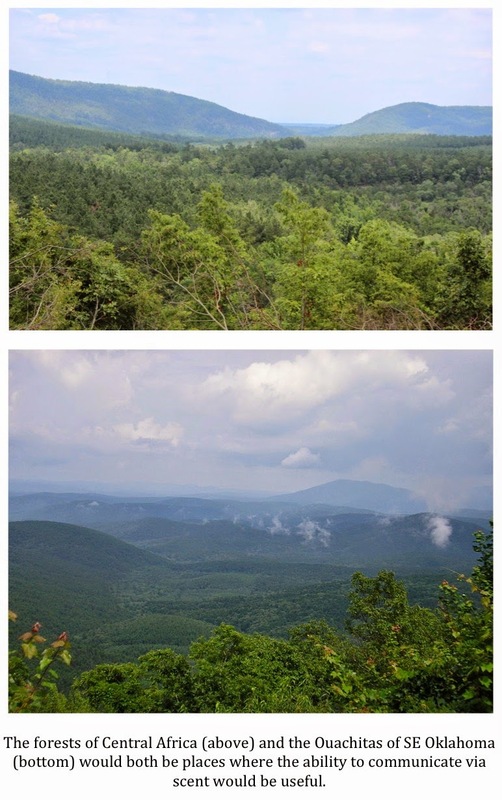 The witnesses, a husband and wife, are avid hikers and decided to stop at Palmetto State Park for a hike on their way home from a trip to New Braunfels. The pair live farther to the east and stopping for a hike was a welcome way to break up their trip and get some exercise. The couple began their hike on the San Marcos River Trail and located what they believed to have been a very large footprint in the sandy soil just off the main trail. 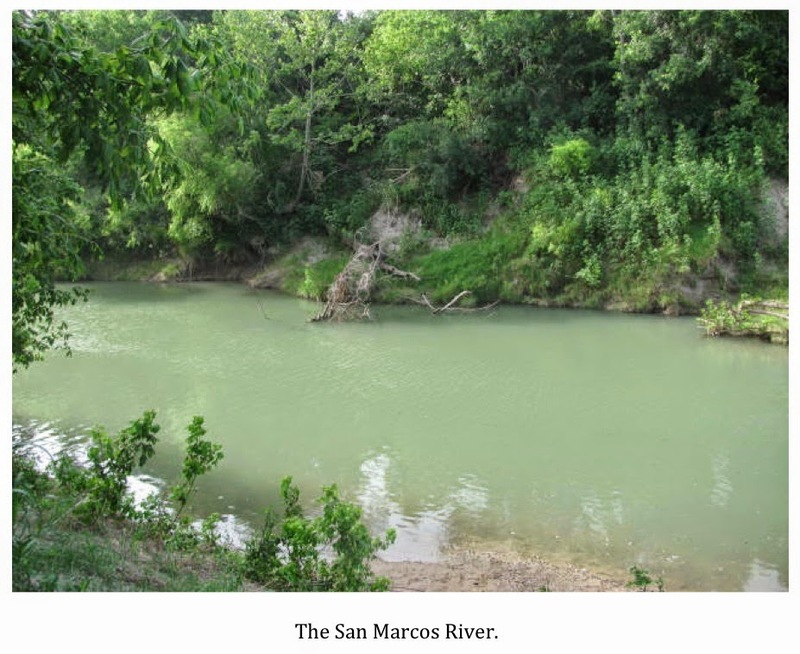 The track was located close to one of the spots where hikers can leave the trail and negotiate the steep riverbank to reach the San Marcos River, approximately 30 feet below. They did not think too much about the track at the time other than the husband commenting, “That was one big boy,” as the track, according to the couple, measured approximately 16” in length. The pair proceeded to negotiate the steep incline to the waters edge below the trail. After taking in the sites along the water and taking a short break, the pair began making their way back up the bank to the trail. The female witness walked ahead of her husband and reached the top first. The bank, slick from recent rains, was giving the husband some trouble as he tried to walk back up. He decided to attack the incline quickly in the hopes that his momentum would be enough to propel him to the top. Just as he picked up his pace, a large rock struck the ground behind him. The rock struck the spot where, in his estimation, he would have been standing had he not decided to pick up his pace just a few seconds before. Both hikers heard the thud of the rock impacting the hillside and then tumbling down the incline toward the water. The husband stated, “Somebody just threw a rock at me!” The wife initially believed that her husband was playing a joke on her until she saw how angry he was about the incident. 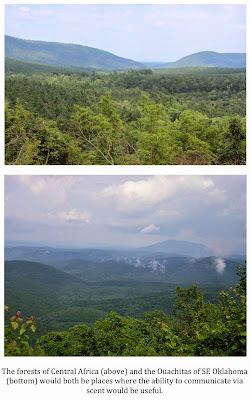 Once the couple crested the hill, they took a good look around and below them in an effort to spot the rock thrower. They saw no one. A bit confused and perturbed, the couple continued their hike. As they walked on, the pair heard various snaps and breaks, which led them to believe the local wildlife was very active that day. Shortly before reaching the point where the San Marcos River Trail meets the Mesquite Flats Trail, the couple heard a loud vocalization from just behind them and in the direction of the river. The couple described the noise as a howl of some kind. They described the sound as similar to that of a cow bellowing but different and deeper. It should be noted that the male witness is a USDA meat inspector by trade and has worked in a slaughterhouse for years. He is quite sure he knows every sound a cow is capable of making and insists what he and his wife heard that day was not a cow. The couple was a bit unnerved and the thought occurred to them that they were being followed or stalked by the unseen rock thrower. Deciding this kind of thinking was silly, the pair decided to continue on the outer loop of the trail instead of taking a shorter route back to the parking area. Shortly after entering the Mesquite Flats Trail, the pair heard another loud vocalization from behind them that was identical to the first howl a few minutes earlier. The pair, getting more uneasy by the minute, picked up their pace significantly. The hiked roughly ¾ of a mile without incident, the female walking about 15-20 feet in front of her husband. 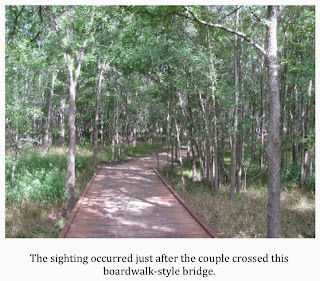 About ¼ of a mile from the point where the Mesquite Flats Trail transitions to the Ottine Swamp Trail, the couple crossed a long boardwalk-style bridge. The male witness was no more than 30 feet beyond the bridge, his wife ahead of him, when the couple heard a loud snap behind them. They wheeled around quickly to see what had caused the loud snap. 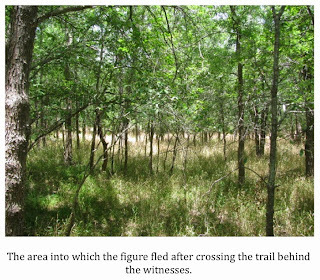 The male witness's attention was focused on a tree limb that had appeared in the middle of the trail. It had not been there moments before. The limb was a bit curved, almost bow-like, in shape and was still rocking or wavering as it rested on the trail. As he stared at the stick, he caught a glimpse of something black to his left moving quickly away from the trail. 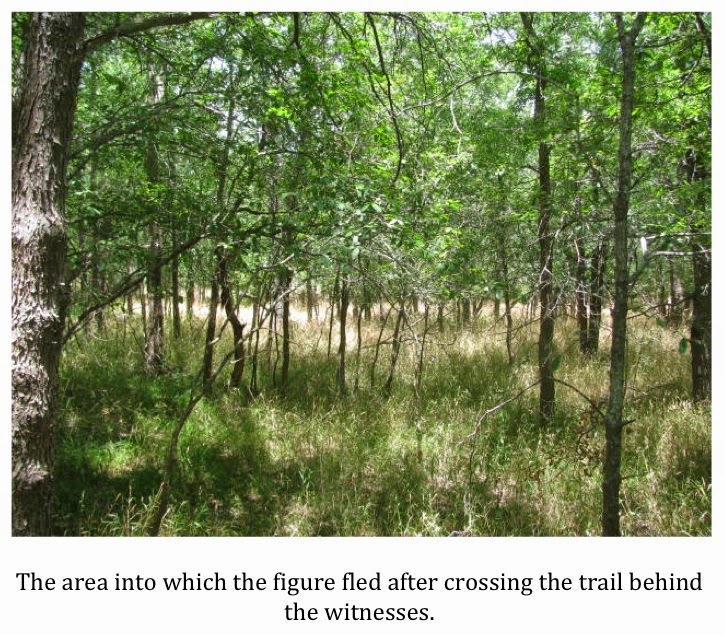 The female witness was not distracted by the stick in the trail and caught site of a large, black figure running at breakneck speed from her right to left away from the trail. She got a good, if brief, look at the figure. 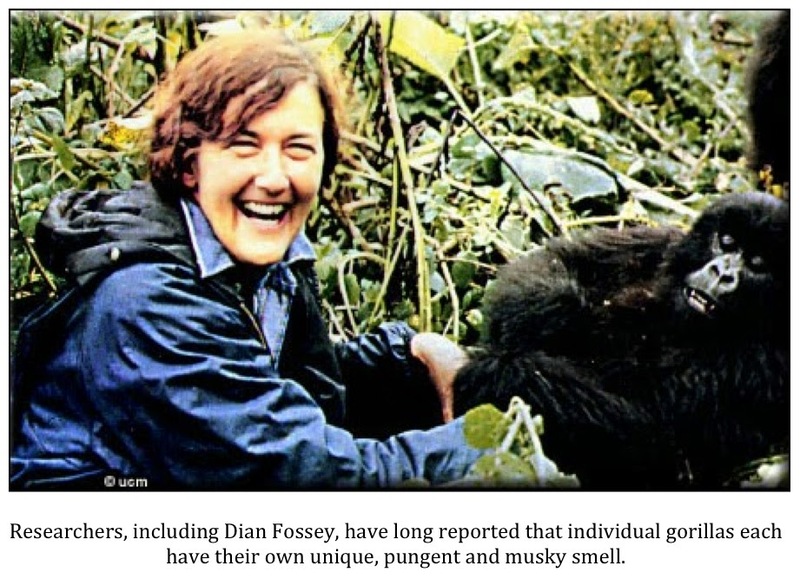 She described it as jet black and “ungodly fast.” She was positive that what she saw was upright and bipedal. While mainly taken aback by the speed of the figure, she also noted that it was very large. The female witness described the figure as “massive.” The only sound the pair reported hearing was four heavy “thumps” as the figure ran away from them. The couple made their way closer to each other and stared out in the direction in which the figure had fled. As they looked, they both saw it, partially obscured by a tree but peeking around it and seemingly looking back at them. 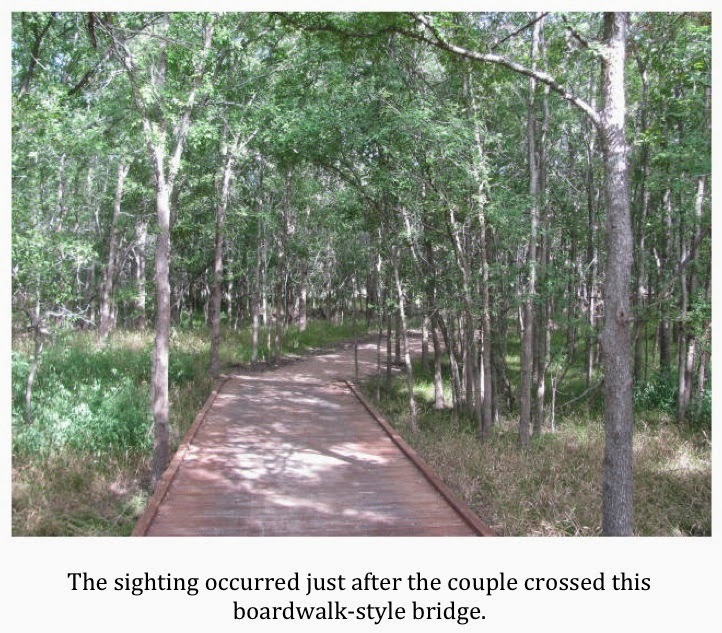 The figure was now roughly 40 yards from the amazed couple as they stood on the trail. 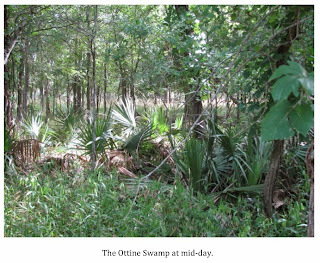 The couple decided to get going and began their hike onto the Ottine Swamp Trail, all the while trying to keep an eye on the large black figure that appeared to be observing them. The trail took a bend back to the right shortly thereafter and some vegetation blocked their view of the figure for a few moments. When the couple got a bit farther up the trail and again had a window through which they could see the tree the figure had been behind, it was no longer there. Neither witness heard it move away. 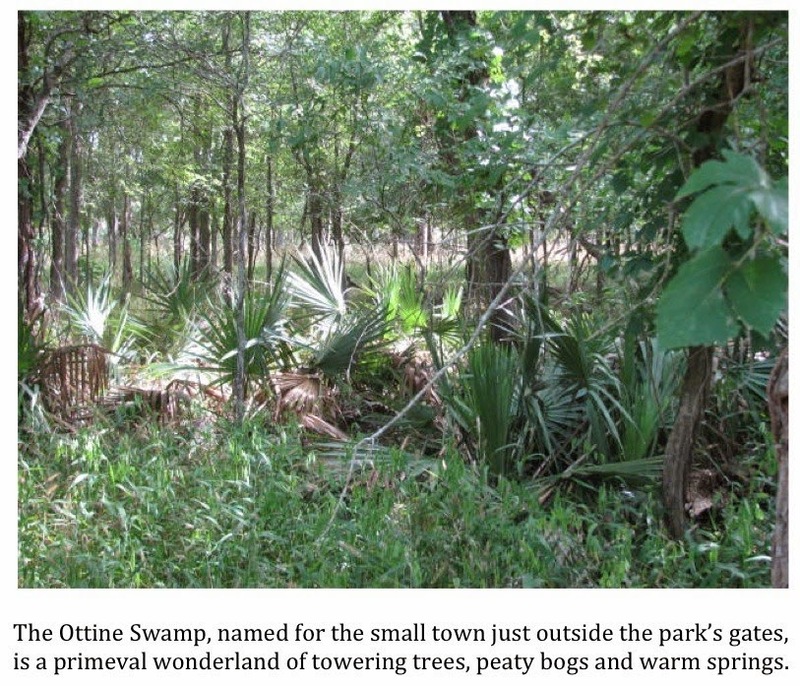 Now thoroughly unnerved, the couple hiked quickly down the Ottine Swamp Trail and back toward Park Road 11 and the parking area. Roughly ½ mile from the end of the trail, the pair heard one last loud vocalization. It was the same loud bellowing/howl they had already heard twice previously. 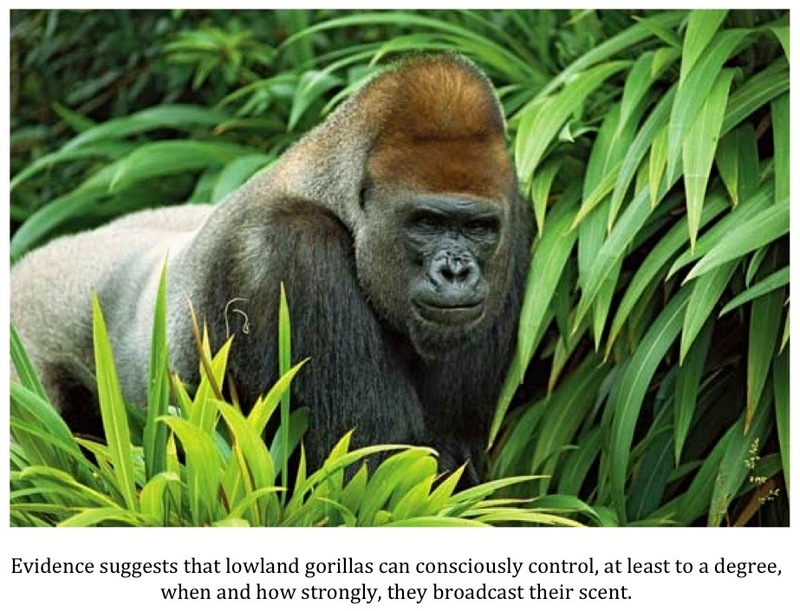 This time, however, the vocalization originated from a spot much closer to them and, much to their chagrin, ahead of them, between them and the perceived safety of the park. Cautiously, but quickly, the couple covered the final ½ mile and made their way back to their vehicle. The witnesses immediately went to the park headquarters to report their experience. They were surprised to hear from the rangers that they get similar reports often. The witnesses claim the rangers told them the most common experiences are strange sounds/vocalizations and rock throwing. 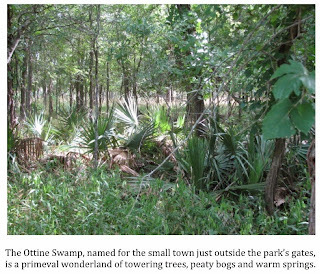 While at the park headquarters, the couple got a brief education on the history of the Ottine Swamp thing or Ottine Swamp monster. 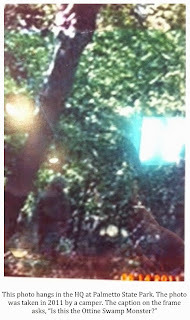 The creature is extremely well known locally and sightings go back decades. 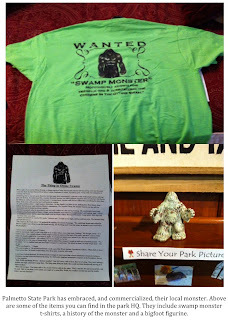 The park actually promotes the monster in their gift shop. A framed photograph, allegedly showing the creature, taken by a camper in 2011 hangs on the wall. A small bigfoot figurine adorns the mantle. Swamp monster t-shirts are for sale and a handout is available, free of charge, which briefly documents the history of the thing in the Ottine Swamp. A bit overwhelmed, the couple returned home and immediately set about doing some research on their own. It was during this research that they came across the NAWAC site and filed a sighting report. I found both witnesses to be very credible. Their story did not vary from the initial written account. Each of the witnesses experienced moments while retracing their steps that day when they got very nervous and had to take a moment to regain their composure. At one such point, the male witness struggled to light a cigarette due to his hands shaking so badly. I detected no signs of deception and, to the contrary, came away feeling that the couple had encountered a form of wildlife for which they had no explanation. 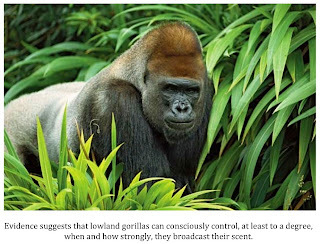 The NAWAC continues to collect and investigate reports of encounters, both contemporary and historical, with strange, bipedal ape-like creatures in Texas and its neighboring states that fit the traditional description of the wood ape. 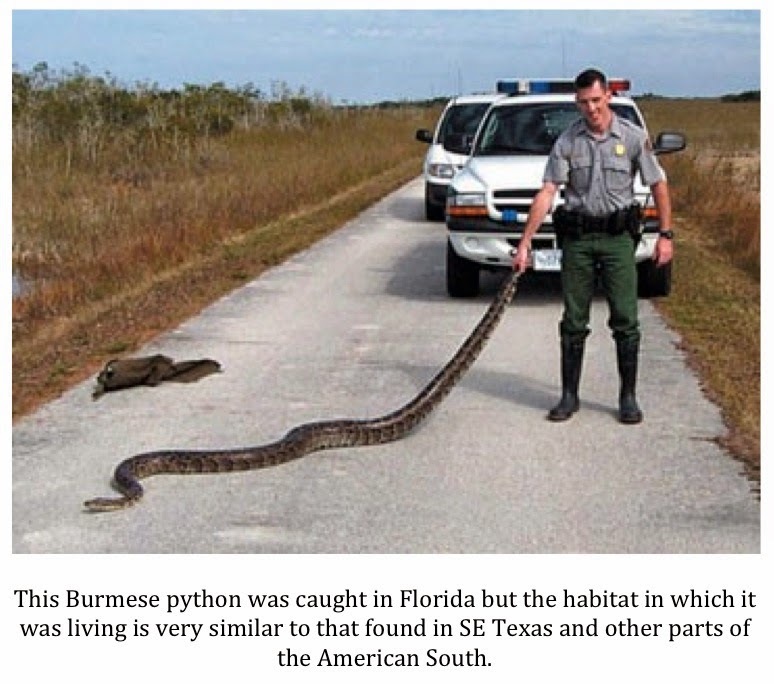 The growing population of Burmese pythons in the Everglades of Florida has become a well-known issue to the general public. While other invasives, such as the Argentine tegu, the zebra mussel and the piranha-like pacu are all causing problems for native wildlife and eco-systems, nothing seems to grab a hold of the imagination of the public quite like the thought of a mammoth snake slithering about the swamps and marshes of the American South. 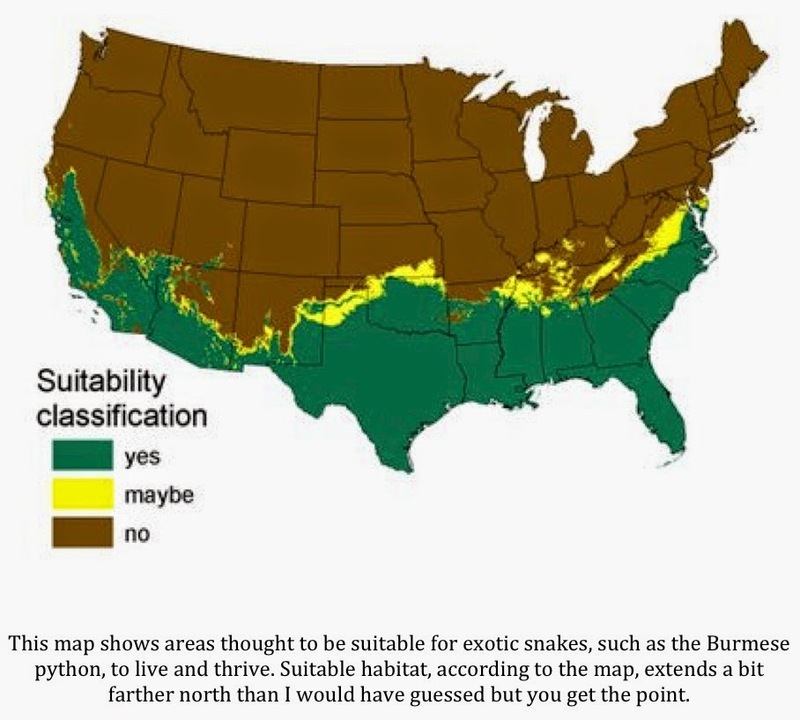 I’ve long feared that the issues with which Florida is currently dealing in regards to invasive snakes could become a problem for us in Texas. 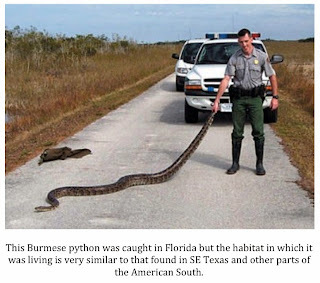 I did a post a while back in which I compared the annual precipitation amounts and average temperatures of the Everglades to those in SE Texas and found them similar enough to think that Burmese pythons, and other exotic reptiles, would do just fine here as well. You can read that post here. While this “invasion” of large exotic snakes has not taken place yet, there have been a few stories that have made their way in to me. You can hit the “giant snakes” tag in the right-hand margin to read about a couple of them. Recently, another account came in via email from a reader detailing an experience he had with a giant snake as a child. As you can imagine, I cannot absolutely verify that the story he tells is true but I can tell you that this reader provided his full name and sent the story in via an email. Most people who provide accounts of this nature simply send them in anonymously in the form of a comment to an existing post making communication after the fact impossible. That is not the case here, so make of all of that what you will. I am withholding the name of the reader of my own volition. He has not asked me to do so. Two young children, a boy 7 and a his older sister, 8, lived occasionally with their adopted “Grandparents” who lived in a wooded area on Taylor Lake near Seabrook, Texas. Their home, well out in the country off a gravel road in those days, the boy and his sister would dismount from the school bus and walk just a little over a quarter of a mile up a one lane oyster shell road leading to the little farm house overlooking the lake. On one particular day, the two children decided to walk through the edge of the woods adjoining the shell road. They were approximately 30 feet or so from left side the road when they approached a downed tree in their path. It was then that they saw something that chilled their blood. They never saw the snake’s head for it had already crossed the length of the rather large fallen oak tree; but they saw the body, as big around as a man’s arm—or more—as it slithered along, and, looking to the shell road as a way of putting distance between them and the snake, the children saw the tip of the tail of the giant snake as it crossed the shell road quite a distance away, disappearing into the grass beside the road. The old couple smiled knowingly at each other and told the children to go out and play in the back yard. Even the children’s parents, who happened to be there at the time, dismissed the report as childish imagination. It just could not be true—there could never be such a snake around Taylor Lake, or in Texas for that matter—or maybe in the whole world. But the children knew it was true and not an exaggeration. For many years, as they grew into their seventies, they sometimes would look into each others eyes and ask, “Do you remember that snake?” The two are still alive today: my sister lives in Dallas—and I live in Houston only 28 miles from where we saw “the snake” sometime around 1947 or 1948. We could never convince even our closest family members and friends of what we saw that day. This story is true and my sister and I will go to our graves declaring it to be so. I suppose it is possible that this gentleman might be overestimating the overall length of the snake. Places and things we remember from our childhood often seem smaller than they did when we were little. Even if this is true, however, this still must have been a really big snake. Even if this gentleman has overestimated the length of the snake by fifty percent, that still leaves us with a serpent that is 20-feet or more in length. There is no snake native to North America that large. There are actually only a handful of snakes found anywhere in the world that approach 20-feet in length. The reader, himself, mentions two of them in his email: the anaconda and the python (several species of python can approach, or surpass, 20-feet in length). That being the case, we are almost assuredly dealing with an invasive animal. 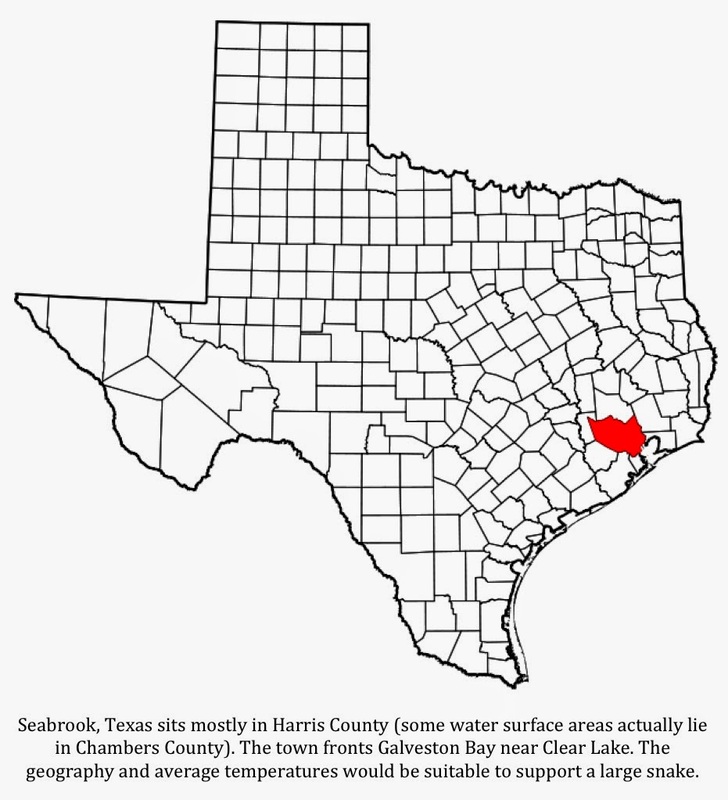 How in the world did it get to Seabrook, Texas? The date of the sighting, 1947 or 1948, predates the exotic pet trade that is causing so many problems today. Another possibility that crossed my mind is that it might have been a true “sea serpent” of some kind. 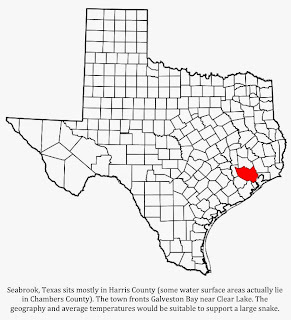 Seabrook does, after all, sit right on Galveston Bay, which in turn, opens up to the Gulf of Mexico. This is an unlikely scenario to be sure, but you never know. One other thought crossed my mind as well. What if this reader has not overestimated the length of the snake he saw at all? That is the stuff of which nightmares are made. If anyone out there reading this has had a similar experience to that of this reader, please email it in to me. I would love to hear about it. It may also help me gauge whether or not we are seeing an increase in invasive species of snake in the Lone Star State.